THE SE KITS ARE FOR THE FRONT FLOOR PANS, THEY REPAIR THE TOE-BOARD WHICH WILL MEET UP WITH THE MAIN FRONT FLOOR PAN AND THAT WILL EXTEND REARWARD TO ABOUT HALF WAY UNDER THE FRONT SEAT. AND COMPLETLY GOES FROM SIDE TO SIDE. A ENLARGED TRANSMISSION COVER IS INCLUDED AND WILL ACCEPT THE LARGER AUTOMATIC TRANSMISSIONS LIKE THE TURBO400, 6L60 ETC. ALL PIECES ARE HEAVY 18GAGE STEEL AND MADE BY EMS AUTOMOTIVE IN DETROIT MICHIGAN. 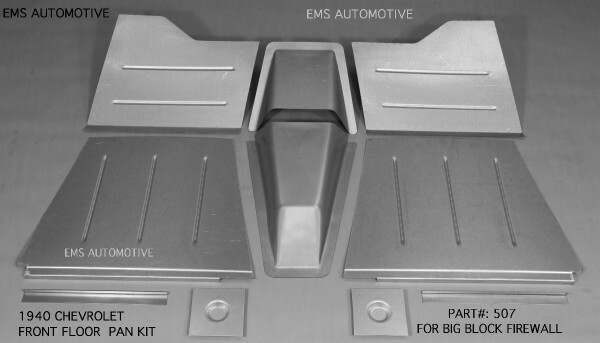 THESE KITS WILL FIT ALL 1940 CHEVROLET BODY STYLES 2DR, 4DR, CONVERT. AND SEDAN DELIVERY.